In 2013, the Uffizi Gallery was named, “World’s Greatest Gallery” by the Times of London. The museum and the treasures that are housed within it have inspired, and continue to inspire, art lovers from around the world. The annual donation amount for the Circle of Contemporaries is $75 for students, $150 for individuals and $250 for couples. Throughout the year, special events, are organized for members and Circle of Contemporaries donors at museums, galleries and private collections throughout the U.S. These donors also enjoy discounted pricing on ticketed events and special offers from partner organizations. -Discounted ticket price for the annual Friends of the Uffizi Gallery luncheon held in the winter at the Palm Beach Jewelry, Art & Antique Show. -An invitation to the annual winter lecture with Contessa Maria Vittoria Colonna Rimbotti, president of Friends of the Uffizi Gallery and Amici degli Uffizi, our sister and founding organization. -Invitations to private museum, gallery and private collection tours and special networking events throughout the U.S.
-Complimentary subscription to The Journal of Art Crime, published twice yearly by the Association for Research into Crimes Against Art. Friends of the Uffizi Gallery work tirelessly to raise awareness of the Uffizi Gallery by providing resources for restoration and education. Their efforts have resulted in funding to restore over thirty priceless works of art and to contribute to structural improvements to the Uffizi Gallery, including the recent opening of the Michelangelo Room. 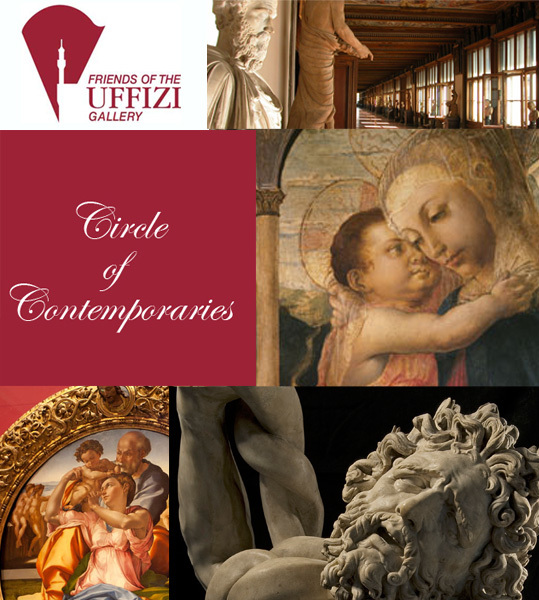 The Friends of the Uffizi Gallery Circle of Contemporaries are donors that are enamored with the Uffizi Gallery and want to support its preservation and growth, but would also like to engage in networking opportunities and events in the United States. Please contact us at friendsofuffizi@gmail.com or 561-289-4090 if you have questions about the Circle of Contemporaries. Your donation is tax deductible under the IRS guidelines that govern 501(c)(3) public charities. * Click here to view our profile on Guidestar, the leading provider of information on nonprofit organizations in the U.S.
*In some instances, the value of goods received by Contemporaries donors may affect the amount of your deduction. Please check with a financial professional, or email us with questions.